The Religion, Ceremonies and Beliefs were based on Animism. Animism was a commonly shared doctrine, or belief, of the indigenous people of North America and Canada including the Great Plains Indian tribes. Animism is based on the spiritual or religious idea that the universe and all natural objects have souls or spirits. In this religion it is believed that souls or spirits exist not only in humans but also in animals, plants, trees, rocks etc. This belief is also extended to natural phenomena such as thunder storms and rain and geographic features such as mountains, caves or rivers also possess souls or spirits. The Plains people believed in Manitou, the Great Spirit. The men also carried a pouch called the 'Medicine Bag or Bundle' which included herbs used in Smudging Rituals. The Great Spirit, the Sun Dance and Vision Quest. Tricksters feature in the legends and mythology of the Plains peoples as do heroic figures or "transformers" who transform, or change, the world into its present state. 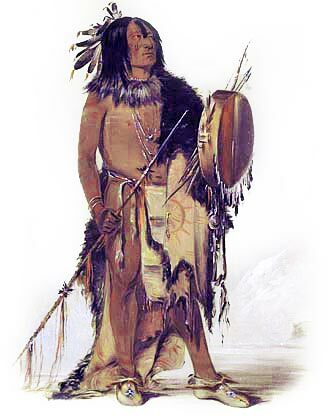 Plains Indians believed in a great god, the Sioux called that god the �Wakan Tanka,� which means the Great Spirit.